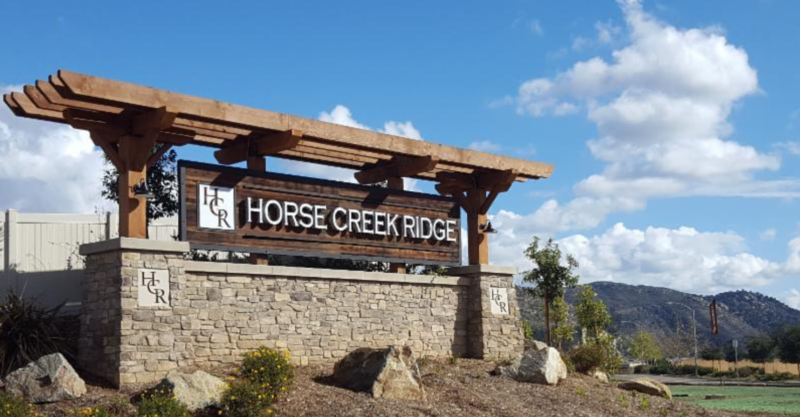 Horse Creek Ridge is a new master planned community by D.R. Horton with seven residential neighborhoods, commercial centers, and a public sports park set into the rolling hills of North San Diego County. The community has extensive HOA maintained landscaping, including wide parkways and trail systems, slopes, two recreation areas, seven neighborhood parks, and extensive open space. To meet those needs, the team called in Sales Rep Erin Hagen of Calsense, a custom irrigation design and resource management company in Carlsbad, CA. “We provide a very high level of customer service and guarantees with our systems, so it is crucial that we have confidence about the quality of the enclosures that house our controllers,” says Hagen. “We consider Kim and his team at StrongBox to be an important resource to us and we find their products to be extremely reliable. We are so confident about the quality and longevity of their enclosures, that we never have to think twice about them.” To date, Horse Creek Ridge features 25 StrongBox enclosures with plans for several more to be used on the adjacent Palomar College Center project later this year. In addition, StrongBox electrical meters can be found along all the major parkways within the development. The meters were specified by Visual Concepts, Inc. a lighting design and electrical engineering firm in San Diego. Kenny Perez, Sr. and his team rely heavily on the quality of StrongBox products and have enjoyed a long-term specifying relationship with them.